The summer is here and next month is my birthday, so, when going through my tea pots and cups, I decided to share a teapot my good friend Mariola gave me for my birthday a while back. She is a beauty! I fell in love with her in a shop, and my friend saw it and picked it up for me. I don't have any like her, and I just love that she is dressed in traditional clothes. The handle is the basket of flowers and the pitcher is the spout. She is so very dainty and sweet. I love her facial features, and the fine hands. Hope you have a tea-riffic day! 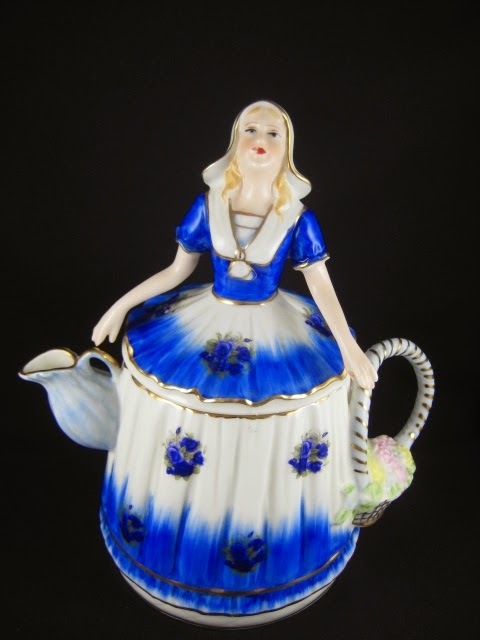 Your little dutch girl teapot is adorable. Have never seen one like it. You have a very special teapot and most unusual. I think it is a real treasure and the fact that a friend got it for you special makes that even more true! So glad you shared. I love your teapot! She is indeed a beauty! What a sweet and unique teapot, Winnie! I love it! How special that your friend gifted you with it too. Thank you for sharing it with us and joining me for tea. Have a happy day. What a great friend you have--that teapot is so unique and pretty! So pretty. I think collecting tea pots would be such a fun hobby.